Rooftop solar PV will reach grid parity in 50 US states by 2016 – up from just 10 now – setting the scene for a dramatic increase in the uptake in household and commercial rooftop solar in the world’s biggest economy. That’s the prediction of Vishal Shah, the leading solar industry analyst at Deutsche Bank, who says that declining system costs, customer acquisition costs, financing costs and rising volumes should drive significant scale benefits . Shah’s prediction was included in his first report on the newly listed Vivint Solar, which is the number two installer in the US. Deutsche Bank considers its prospects are so good that it will at least double its sale in each of the next two years. But it is also predicting big things for the US market, based on a continued fall in installation costs of solar, the cheaper cost of finance as new financial models attract more mainstream funding, and assuming that the attempts by utilities to curtail the proliferation of solar are resisted. This graph below gives an idea (click to enlarge). In 2013, the US installed around 1GW on residential rooftops, little more than was installed in Australia, with a fraction of the population. But in the next three years the installation rate is expected to rise six fold by 2016. Vivint, which had just 130MW of installed capacity at the end of June, is expected to have more than 4GW by 2020. Vivint Solar is interesting because it is an offshoot of a home security company that has used its customer base and customer service model to attack the residential solar market with considerable success. Rather than an on-line model favoured by rivals, Vivint goes door to door. 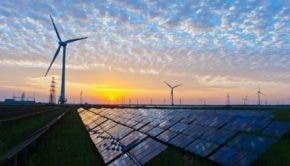 It uses a relatively unique power purchase agreement model, that sees it selling solar electricity at an average of 14-15c/kWh – a discount of 15-30 per cent below the utility price in its markets. Customers enter a 20 year contract with no or little up front fees. There is a 2.9% annual escalator, but this is still expected to track below rising utility prices. The escalator is likely to fall. Currently, it only operates in 7 states where the grid price is highest – in the north east, California, Arizona, and Hawaii. But Deutsche Bank says its target market will rapidly expand as solar costs continue to fall and grid prices rise in other states. And Deutsche expects the fragmented solar market to consolidate rapidly in coming years. One of the reasons is the availability of finance. Currently it comes through tax equity structures inspired by the investment tax credit, currently at 30 per cent. Deustche Bank says this ITC could change, but it estimates the cost of finance to fall from between 7 to 9 per cent to around 5.4 per cent by 2015. This will help new financing models such as yieldcos, solar loans, asset backed securities and retail bond offering. Source: RenewEconomy. Reprinted with permission.